Blackwood UC affirms that Marriage for Christians is the freely given consent and commitment in public and before God of two people to live together for life. 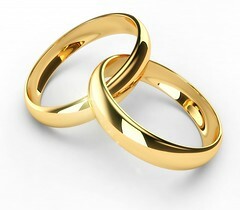 It is intended to be the faithful lifelong union of two people expressed in every part of their life together. In marriage, the two people seek to encourage and enrich each other through love and companionship. BUC is an inclusive church and we welcome enquiries about marrying at Blackwood. On first contact with the church office a tentative booking is made for your selected time and date. By returning the Marriage Booking Form, your date is confirmed. If any changes are made later, to the time etc., you are required to ring the church office and let them know. One of the ministers of the church will contact you around three months before the wedding, to arrange interview dates. If you wish to use your own minister you will need to seek permission from our ministers first. Decisions affecting this principle are decided ‘case by case’, in negotiation with the our ministers. P1ease contact the church office for further information. An initial meeting with the minister, where you get to know each other and the ‘PREPARE’ questionnaire is completed. The church has a commitment to help you establish a rich and lasting relationship and requires all couples to participate in pre­-marriage counseling. PREPARE is the short, confidential counseling resource used by many ministers throughout Australia. It consists of questions that help a couple explore their relationship, so that you can both be aware of the strengths and growth areas. The ‘Notice of Intended Marriage” (white form) which must be filled out no later than one month and no earlier than eighteen months before the marriage. The minister must see your original (and full) Birth Certificates and if applicable Death or Divorce papers. The minister is required to use a service that fits with the ethos and theology of the Uniting Church in Australia. When your booking is confirmed, you will be assigned one of our ministers. If you wish to use the services of another minister, they are to contact the minister from Blackwood Uniting Church seek permission. Decisions affecting this principle are decided ‘case by case’, in negotiation with the Blackwood minister. Please contact the church office for further information. The choice of hymns, songs, entry and exit music can be discussed with the minister and when necessary the organist. Copyright on music must be observed. The main entrance leads into a spacious foyer where the bridal party can assemble. Double doors open into the rear of the worship area. A central aisle leads to a raised open area at the front with plenty of room for the wedding party, musicians, and a table for signing the registry. The worship area has seating for about 250 guests, or 350 if the folding doors at the rear are opened. The hall which adjoins the worship area can be used for refreshments and receptions. Spaces are reserved for your wedding cars. Parking is available at the rear of the church for your guests to park. We ask that confetti not he used either inside or outside the church. Flower petals or bubbles are fine, outside the building. As a general rule, there are no objections to the videoing of the service, provided that it does not intrude and that no bright lights are used. Only the official photographer is permitted to take photographs during the ceremony. The inclusive amount is $850. A deposit of $150 should be made upon booking the Church through the office and the balance paid at least four weeks prior to the wedding. Please make cheques payable to: “Blackwood Uniting Church”. Please contact the Church Office on 8278 7699.